Pirates Treasure Match 3 is a fun game. embark on this Pirates treasure adventure trip, switching your way to the glory through addictive match gameplay. you must find real treasures in this old kingdom. Burst large bunches of jewels by matching them in a sequence of three to fuel exclusive power-ups and score sweet bonuses! your aim is to become a pirate and to collect more coins To make your dream come true, you must find real treasures using the old maps. Are you hungry as pirates and be brilliant as kings? 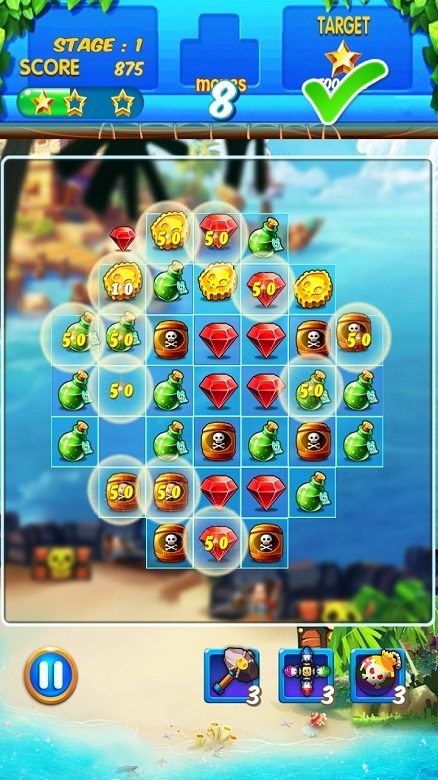 You might get into an addictive blast while surviving in this Pirates Treasure Match 3 puzzle adventure.